This drawing covers the south bank of the River Thames from Deptford to Erith. Pencil and red ink rays extending from fixed points are clearly visible on the manuscript, and were used to plot the survey of the area. 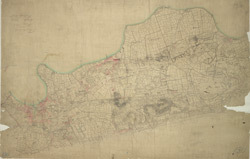 The numbers 1 to 7 in red ink across the map indicate the position from which field sketches were taken. Buildings are infilled and blocked in red at settlements like Woolwich and Greenwich. Clearly indicated is the Woolwich Warren, site of naval shipbuilding since the early-16th century. Before the Royal Arsenal was officially established there in 1805, the Warren had been home of military armsworks for more than a century.